New Glarus Brewing came out with a new beer that will want you to run free with all of this warm weather. Break out the BBQ, pack a picnic basket, and delight in the warmth of the summer sun. Shed some layers and get ‘Totally Naked’ with New Glarus Brewing all summer long. Totally Naked is made with two-row barley malt with a mellow and smooth body. Imported Noble Hop varieties from Germany and the Czech Republic ensure a fine mature aroma with no coarse bitterness. Expect this beer to pour a delicate golden hue that sparkles in the summer sun. This lager (4.2% ABV) is brewed using all natural ingredients with no artificial additives of any kind. Kick back, relax and enjoy the simple unadorned flavor. You can find this beer at your favorite market into the Fall, then not again until next summer. When New Glarus Brewing was founded in 1993 there was a long held notion that only mega brewers were able to brew pale lager beers. Craft brewers had up until that time only brewed hoppy dark ales. It was speculated that craft brewers lack of precision and proper equipment made them ill suited to brew such a precise beer style. Due to this commonly held belief, Daniel Carey, Diploma Master Brewer at New Glarus Brewing, was dared to brew an American lager. True to his understanding that “all beer styles are legitimate and worth exploring”, the result of this challenge thankfully allows all in Wisconsin to get ‘Totally Naked’ throughout the summer. Last week, the Brewers Association released a list of craft beer’s top 50 breweries, ranked by 2009 beer sales volume. The top five include: Boston Beer Company, Sierra Nevada Brewing Company (no surprise there! ), New Belgium Brewing Company, Spoetzl Brewery, and Pyramid Breweries Inc.
Also on the list was Blue Point Brewing Company, a local Long Island brewery, which was ranked #43. 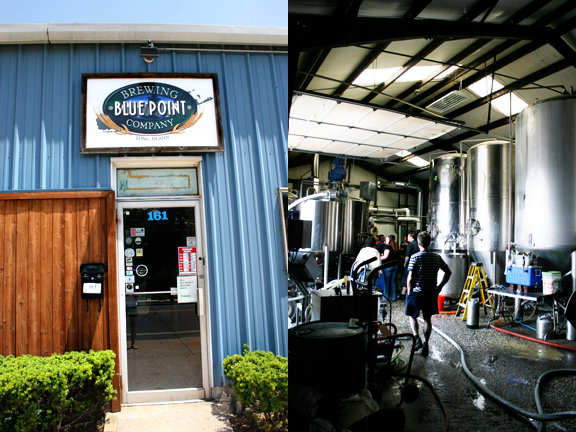 Congrats Blue Point! 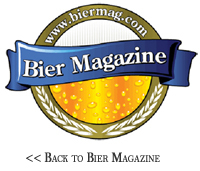 Click here to view the complete list, which also has the top 50 overall brewing companies. German designer Sven Goebel used over 300,000 beer coasters to create walls and furniture to build house and set a new Guinness World Record for the biggest house made of regular beer coasters. The 21 year old has been working on the five-room house since January. The beer coaster house was partially furnished with armchairs, a table and a fireplace, before Goebel sent it tumbling down this past Sunday. The New York Times just printed a story on Feb. 28 about breweries in America that are offering educational and “hands on” classes on brewing. Here is a list of breweries that offer packages where you can stay and brew. Woodstock Inn Station and Brewery (135 Main Street North, Woodstock, N.H.; 800-321-3985; woodstockinnnh.com). Brewery Weekends are offered in April and May; $118 per person, not including lodging. The weekend package includes a Friday reception, meals on Saturday and the chance to brew with professionals. Samuel Adams/Copley Plaza package (138 St. James Avenue, Boston; 800-441-1414; fairmont.com/copleyplaza). The brewery experience package is offered January to May and September to December, subject to availability. Doubles start at $429. Dogfish Head Craft Brewed Ales has a weekend package through the Inn at Canal Square (122 Market Street, Lewes, Del. ; 888-644-1911; www.theinnatcanalsquare.com) that includes a brewery tour and a $50 dinner certificate for the Dogfish Head brewpub. Packages start at $480, double occupancy, depending on the season. Rogue Ales (Chatoe Rogue Micro Hopyard, 3590 Wigrich Road, Independence, Ore.; 503-347-8288; www.rogue.com). Double rooms at the house on this hops farm start at $90 per night. Anheuser-Busch St. Louis Budweiser Brewery Tours (12th and Lynch Streets, St. Louis, Mo. ; 314-577-2626; www.budweisertours.com). General tours are free. Beermaster tours are $25 for those 21 and older and $10 for ages 13 to 20. Fox News released a report last week stating that beer may be good for your health after all. A new analysis of 100 commercial beers shows the beer is a significant source of dietary silicon, a key ingredient for bone health. New Glarus Brewing Company just released two great beers to get you in the mood for the holiday season. 1. Wisconsin Cran-bic, part of their “Unplugged” collection, is a beer dedicated to Wisconsin and its natural surroundings. Wisconsin Cran-bic is a mix of wine and beer with a touch of a little fruit. Since Wisconsin provides more than half of the world’s total supply of cranberries, and is the number one cranberry producing state in the nation, Daniel Carey, Brew Master at New Glarus, used this 500 year old brewing style with the state fruit, cranberries. To further update this authentic style, Daniel has embraced the use of wild Wisconsin yeast. It’s made with spontaneous fermentation true to the original lambic style and aged in oak barrels. 2. Don’t miss out on their Snowshoe Red Ale. The warm and rich flavors of Snowshoe Red Ale help everyone appreciate the stillness of a Wisconsin Winter. Snowshoe Ale is brewed with a blend of roasted American and German caramel malts. The complicated decoction mash process ensures a rich malty backbone, which is balanced by elegant Czech Saaz and Bavarian Hallertau Hops. Expect this beer to pour a beautiful copper-red with a fruity ale body and a spicy hop finish. Tip: Try pairing this beer with Wisconsin Gouda, Pork Roast or even a Reuben Sandwich. Forget the hot chocolate and eggnog, sit back and rejoice in the season with one of these nice cold beers.